A SAFETY WARNING THAT'S GONE UNNOTICED. ON FIRST GENERATION PTS, CHECK THE UNDERSIDE OF YOUR BATTERY TERMINALS FOR CRACKS IF OVER TIGHTENED! a possible hidden problem waiting to happen! If over tighten these poorly designed battery terminals. crack, loosen, corrode and deteriorate. Three salvage yards, looking at twenty three PTs, I hadn't found a used battery cable with good terminals unfortunately proves it! All were cracked! So SOOO BIG wasn't the only one! Simply four new copper cable ends, a good set of "better" used salvage yard Freebe terminals and a little elbow grease. . . . I used this type of stronger terminal shape and design to allow for the same cable configuration as original, allowing the cables to come up from the sides of the battery. $6.12 for the copper wire ends with a loaner of a neat crimping tool! $1.50 for the battery terminal and cable corrosion protector. $0.00 for the free set of salvage yard terminals. TEN SCROLL DOWN PHOTOS, NARRATED WITH A "HOW TOO" AND SUMMATION AT END. SOOO BIG's old Battery Cable Assembly 04671631AE with broken copper terminals, new wire ends and the loaner crimping tool. There are four removal points to get the Battery Cable Assembly out of your PT; Starter, 13MM nut, engine ground 15MM bolt, left fender ground 14MM nut and two 12MM nuts in the PCM box. After carefully prying out the cable, twist the fine bundle of copper strands in the cable tightly to restore cable configuration integrity. This allow the fine copper strands to stay in place when the cable tip is cut to size. Cutting the exposed cable tip to a 1/2" end length. As mentioned above, twisting the copper wire strands in the cable tip tightly, restores cable configuration integrity. This allows the stranded wire to stay in place and nicely fit into the copper end piece prior to crimping. The Loaner Crimping Tool in use after a mighty blow with a hammer! The final finished crimped copper cable end. Carefully bend the copper cable ends to about 75 degrees to allow cable to access terminals from the battery sides as original. See photo of finished installation of the battery, "new" terminals and new cable ends for configuration. It'll fit just like old ones..
Close up view of the painted black negative terminal in place with the two copper cable ends securely attached. Looks like original equipment, huh? Full view of finished results with both terminals and all cable ends reattached to the terminals. Note the Battery Terminal and Cable Corrosion Protector goop is slathered all over the terminals and cable ends. I was careful not to paint red and black on the post contact areas of the Freebe terminals. 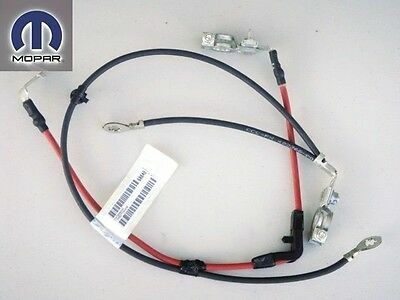 Battery Terminal Cable Corrosion Protector packet. Yucky stuff but I'm told it really works! PT CRUISER SAFETY SUGGESTION CHECK! As a reminder! Just to be safe! At least go under the hood of your PT, pull up the the air cleaner assembly and take a quick peak at your terminals. They might looks OK from the top but try to look underneath too. they could already be split or cracked! Tightening them at that point is useless 'cause they're's nothing to tighten. Do the $7.62 trick! I did keep SOOO BIG alive and kicking for a few more days by tapping the terminals down just a bit but it's was no long term fix! That just gave me a set of wheels to do the salvage yard search without success and show off his "new" seats. Usually extraordinary corrosion is the last sign your terminals are cracked but stopping dead at 80MPH on an interstate because a corroded battery terminal just worked loose can be your first warning. For $7.62 it's a reasonably price, quick and easy fix that'll leave you with a better than factory repair. Let us know how your terminals are holding up and if you use this reasonable repair as a preventative. rcktpwrd, TaupeCruiser and Handy_Cruiser like this. I tightened up this useful article about the failure of the terminals on the 04671631AE battery Cable Assembly as much as I could for brevity, making easier and quicker to read. If you find your terminals are also cracked, I hope you can take advantage of this cost saving, easy to do safety repair that you might find hidden under the air cleaner of your prized PT Cruiser. PLEASE CHECK YOUR BATTERY TERMINALS ON YOUR FIRST GENERATION PTS! Was it only SOOO BIG and the twenty three salvage yard PTs I looked at that had cracked battery cable terminals, or are there others waiting to be found and corrected? Is this a common, costly, unnoticed occurrence? JUST A SAFETY WARNING THAT MIGHT SAVE YOU BIG BUCKS! Last edited by ptprice; 05 Jun 2017 at 12:11 pm. That I can remember, haven't had any complaints on cracked battery terminals but since it's a hidden area, most people wouldn't even think to check it out. Thanks for your input. The terminal on the right is the positive. The metal just corrodes so much it disintegrates away. rckstein, maybe what I found with these "FREEBE" salvage yard terminals is a set of PT battery terminals just like the ones you posted. Are they from a later model than 2005? Actually at least they're designed with stronger metal and they won't crack when tightened. In SOOO BIG's case because they're installed as tight as necessary and with all that preventative non corrosive compound I've slathered on both terminals and the cables we should be good to go! Last edited by ptprice; 04 Jun 2017 at 03:34 pm. The terminals you found is how the Gen2 cables attach, with a nut onto the stud. Last edited by rckstein; 04 Jun 2017 at 03:56 pm. rckstein. Good to know. So apparently, without any foreknowledge I figured out the same thing it took Chrysler five years to correct! I can only hope my safety warning and cheap fix for the earlier model PT battery terminals and cable will help a lot of the earlier PT owners. I'm glad I didn't know that before. I'd a probably chunked down moderately big bucks for a new cable like you did to fix it! Lets pass it on. Thanks for the info. I'm posting to the thread to keep it current, just so more first generation PTers might know this. Let us know what you find when you peak under your air cleaner and check your terminals for cracks and corrosion if they've been over tightened. Especially look to the underside of the terminal. Good luck. Well it's more than a week after my effort to finally correct corrosion on the positive battery terminal so I checked how it looks. From the photo you can see the beginnings of corrosion by the small under layer of green residue under the red terminal. At least all the cable ends still look clean! Thinking my solution, that parallels Chrysler's second generation fix of using these second generation terminals instead of the first generation copper battery terminals, would be proved when I took a peek this morning. NO LUCK! I must go to those more wise than I in all things PT! I still think I'm on the right track! How come the corrosion's continuing on the red post? Should I have additionally installed those corrosion preventative felt washers under the terminals?. . .It it that I've used two negative battery terminals and the one on the positive post isn't sized correctly and doesn't make enough contact on the positive post, promoting the corrosion?. . .Or is it that I used old used salvage yard terminals, no matter how well I cleaned them, instead of new ones?. . . I think at this point it is an easy fix! Possibly all the above! I'm heading over to AutoZone this morning and buying some similar new terminals, some felt washers and more corrosion gel. Please advise. You shouldn't get corrosion that fast...I'd take a look to see if you have a slight crack around the positive terminal.